In the left column menu select the “My Profile” link. When this link is clicked it will expand and reveal new options. Within these new options that have been revealed, select the “Company Profile” link. You are now on the company profile edit screen. Locate the panel labeled “Data Export”. To build the data dump file, Click the “Export My Data” button in the panel. Data exports are not immediate! When you click the data export button you are signaling to the software that it needs to download all of your records into a zip file. This process can take up to an hour depending on how many records you have in the system. After clicking the button you should see a success message letting you know that the data dump background job has started. You will receive an email when the data dump is complete that will contain further instructions on how to access your .zip file. If you do not receive an email within one hour of initiating the data dump then you may need to check your SPAM folder for the notification. If the notification is not in your SPAM folder then please let us know that you are having trouble with your export. 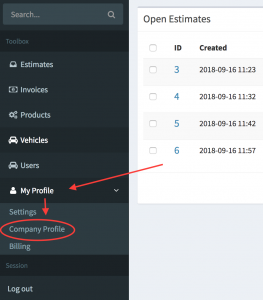 After receiving the email, navigate back to the company profile edit page and locate the “Data Export” panel. 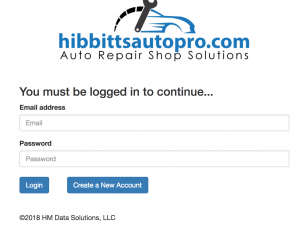 Within this panel you’ll find a link to the zip file that contains all of your company records that live within hibbittsautopro.com. Click on the link to begin the download.